Affordable 3U Unit Now Supports 8 TB HDD plus SSD & SED. Up to 16 Host Ports; 1.2 Million IOPS; 5,500 MB/sec. ; 1,920 TB. FX-3U16 affordably delivers 1,200,000 IOPS – 5,500 MB per sec. – 16 host ports – Hybrid SSD & HDD arrays – automated multi-tiering – 1,920 TB capacity – redundant failover controllers – snapshots & replication. Need pricing? Click here . . .
FX-3U16 Base Unit with Expansion Shelf. ￼The FX-3U16 Series supports up to 1,440 TB with up to 14 optional 3U expansion shelves. ￼FX-3U16 with 4 Fibre Channel 16Gb ports plus 8 iSCSI 1GbE ports. ￼FX-3U16 with 8 Fibre Channel 8Gb ports plus 8 iSCSI 1GbE ports. ￼FX-3U16 with 4 iSCSI 10GbE ports plus 8 iSCSI 1GbE ports. FX-3U16 with 16 iSCSI 1GbE ports. ￼FX-3U16 with 4 SAS 6Gb ports plus 8 iSCSI 1GbE ports. ￼FX-3U16 base unit with 8 iSCSI 1GbE ports. FX-3U16 expansion with 4 SAS 6Gb ports. 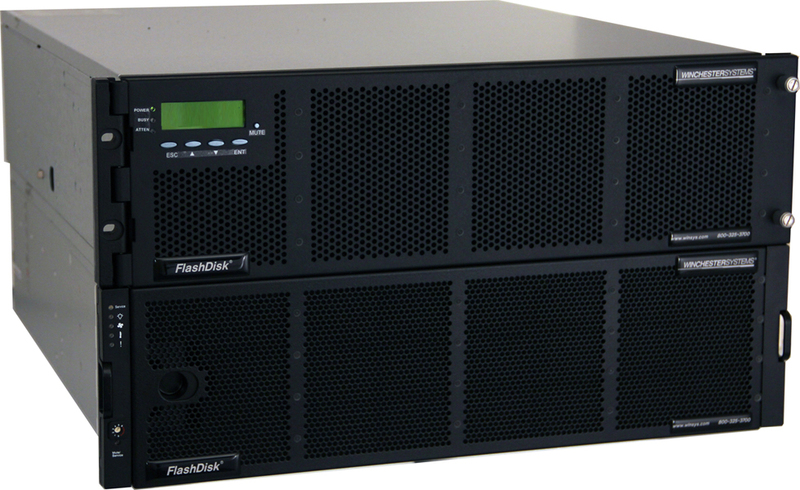 FlashDisk FX-3U16 offers enterprise capability at a fraction of the price of competitors. This 3U storage system support 16 internal HDD, SED or SSD disks plus single or dual redundant failover and auto failback controllers. Each controller has four iSCSI 1GbE host ports plus modular plug-in Fibre Channel, SAS, iSCSI 10GbE or additional iSCSI 1GbE host ports that can be inserted and removed as needed. The FX-3U16 supports up to 16 host ports per system, the most in its class, and is a virtual “SAN-In-A-Box” that provides incredible flexibility for both primary storage and replication applications and can eliminate switch costs entirely. Any host port can be configured for either host I/O or remote replication. FX-3U16 supports a mix of SSDs, SEDs and HDDs internally and in 16-bay expansion shelves to optimize capacity, performance and price. It expands to 1,920 TB using 8 TB disk drives in 14 sixteen-bay 3U expansion shelves.